At PROJIMO, the village rehabilitation workers put plaster casts on the legs and feet of many disabled persons, for different reasons. Sometimes casts are taken to form molds for making leg braces (orthopedic appliances). 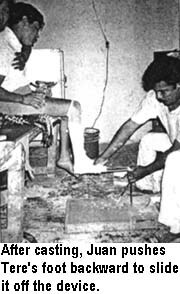 Or a series of casts is used to gradually correct deformities of the feet or ankles. An example is the correcting of a baby's club feet. A COMMON PROBLEM. Whether for brace-making or correction of deformities, often it is hard to hold the foot in the correct position while wrapping it with plaster bandage. The assistant who holds the foot must keep shifting her hands to permit the wrapping. As a result, the foot is often casted in a poorly corrected position. As soon as it is wrapped, it may be positioned more correctly. However, this repositioning can create wrinkles in the plaster which, after it hardens, can cause painful pressure, and can even damage the skin and underlying tissues. PROJIMO workers have often found it hard to hold the foot in a good position while casting it. This is especially difficult in persons with strong spasticity or stubborn contractures. Sometimes, several attempts at casting are needed to get the position correct. Or the cast must be removed to relieve pressure or pain. Especially in persons who lack feeling in their feet (spina bifida, spinal-cord injury, leprosy), it may be hard to prevent pressure sores. Casts must be removed often to check the skin. In such persons, adjustable braces are sometimes safer than casts to correct deformities. A GOOD SOLUTION FOR EASIER CASTING. In February, 1996, I (the author) had surgery on my foot, to fuse my ankle bones. The cast was changed in 2 weeks. To position it correctly, the surgeon put my foot on a flat metal bar in the form of an up-side-down "L", which was mounted in the cement floor. He placed my foot and leg in exactly the desired position and asked me not to move. He wrapped a plaster bandage around my lower leg and foot, also covering the flat bar under the foot. When the plaster was fairly hard, he slipped the casted foot backwards off the bar. Then he gently pressed the plaster on the bottom of the foot to close the slit that was left from the bar. 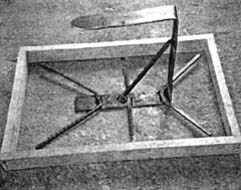 With this simple device, the foot can be positioned correctly and held firmly during casting, without the hands of an assistant getting in the way. When I was next at PROJIMO, I described this innovation to the team. Marcelo and Polo began to make one right away. Rather than mounting the device in the floor, they decided to mount it in a rectangular slab of cement so that it could be moved from place to place. To make the bar, they used a 1.5-inch-wide steel strut that they found in the wheelchair shop. This they hammered into a "U". On one arm of the U, they welded cross-bars of re-bar (construction rod) so that it would be held firmly within the cement base. Then they made a 2-inch high rectangular wooden frame. They set the steel-bar U within it, and then filled it with cement. 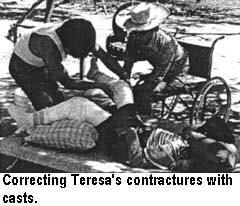 Because of strong muscle spasms, Tere's foot had been very hard to cast by hand-holding it. But with the new foot-positioner, it was remarkably easy to position and to cast her spastic leg. It was a bit hard to pull the casted foot off the device after the plaster hardened. This problem was corrected by smoothing and rounding the edges of the bar with a file and sand-paper. The new foot-casting bar is a great success. And so simple! Folks at PROJIMO wonder why they didn't think of it before.